A five bedroom Georgian country house set in four acres, located in Shropshire, has recently upgraded from expensive oil heating to a carbon neutral Euroheat HDG biomass boiler, installed by the Efficient Energy Centre. 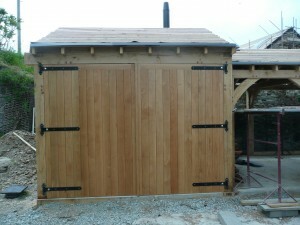 The new system comprises of a Navora 30kW log boiler, with 2,000 litre accumulator. Part-funded by the Renewable Heat Premium Payment (RHPP) stage two, with a grant of £2,000, the system should benefit from the domestic Renewable Heat Incentive (RHI) when it is hopefully launched next spring – the owners are already enjoying considerable savings on their fuel bills. Step 1: The first step in a biomass installation is laying the underground pipework, once this has been completed concrete foundations are built for the boiler house where the equipment is stored. The purpose-built boiler house, with log store to the right hand side. Storing logs in a covered but well-ventilated area is essential. For a biomass boiler to work at its’ optimum, moisture content in the fuel should be 25% or less. Logs should be split, to increase bark free surface area, and left to dry for 18 months. 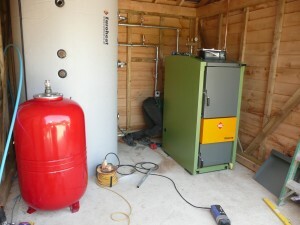 Step 2: Once the biomass heating system has a ‘home’ it needs to be positioned inside the boiler room before connecting. 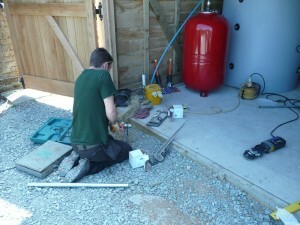 Efficient Energy Centre installer, Owen, pre-fabricating fittings to connect the biomass heating system together. The expansion vessel fitted to the accumulator. Accumulators are required to store hot water, allowing the boiler to run most efficiently; at full steam, switching off when the accumulator is full. The accumulator then keeps this water warm, providing on-demand heating and hot water for building occupants. The completed boiler room, including Navora 30kW log boiler, accumulator and expansion vessel. 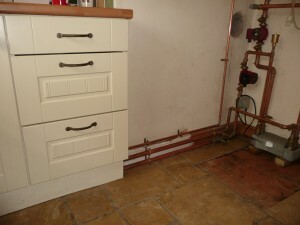 Step 3: Once all the equipment has been positioned and installed, the flue is put up and the heating system commissioned. 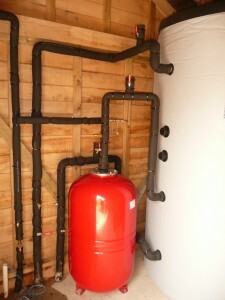 Step 4: Following the commissioning of the boiler, work can start inside the house to connect the biomass system to existing pipework (in the case of a retrofit project). 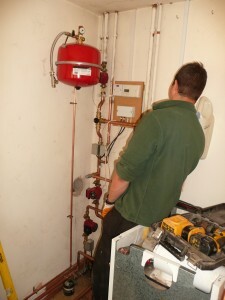 Steve, one of our installers disconnecting the oil boiler, to make way for the biomass system. The heat exchanger separates the biomass and existing circuits, creating two pressurised circuits.